From boodles to zoodles, spiral-cut squash noodles are having a moment as the go-to gluten-free, paleo-approved star substitute for pasta. But let’s get real. Who has time for all that peeling, cooking, and kitchen gadget wizardry—especially on a weeknight? 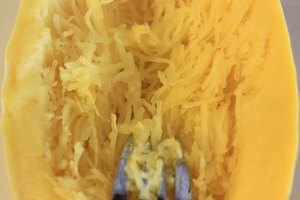 To get your veggie noodle fix faster, Lisa Williams over at Happy Happy Vegan suggests turning to nature’s original pasta from the vine: spaghetti squash. “This winter wonder is perfect for days when you want to up your veggie intake [but] can’t be bothered to take out the vegetable noodle maker,” says Williams. And her hack for always having spaghetti squash on hand? Freezing it. So here’s a super straightforward (and pretty genius) plan for cooking and freezing your own spaghetti squash. Prep it on an easy Sunday and you’ll have gorgeous strands of golden, nutrient-packed squash noodles ready to step in for that box of Barilla...whenever you want. Line a large, rimmed baking sheet with aluminum foil or parchment paper and preheat the oven to 400°F. 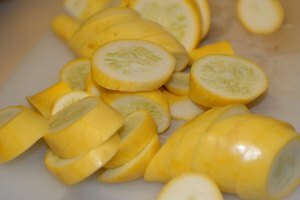 With a sharp knife, cut a half-inch off both the top and bottom of the spaghetti squash and discard. Next, cut the squash across the width into one-inch-thick rings. Run a spoon around the inside of the rings to scoop out the seeds. 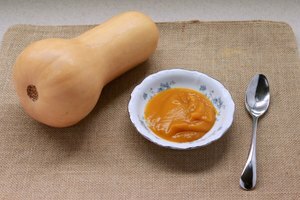 Note: Most spaghetti squash recipes call for cutting the gourd in half lengthwise, but cutting it crosswise preserves the natural span of the vegetable's fibers. The result? Angelic strands of squash that will twirl around (and around) your fork, more like real spaghetti. When the rings of squash are cool enough to handle, gently rake the strands away from the outer shells with a fork. What's even more satisfying? Pulling the golden filaments apart from the peel with your fingers. Let the cooked squash cool to near room temperature and then transfer the noodles to freezer-safe zipper bags. To avoid freezer burn, squeeze as much air as possible out of the bags before sealing them shut. Stored in the freezer, cooked spaghetti squash is good to go for up to eight months. Tip: Pack your cooked spaghetti squash into separate, portion-sized freezer bags and label them. The right amount will be ready and waiting for your sides, salads, and make-ahead spaghetti squash casseroles any night of the week. If you have the time or forethought to thaw your frozen spaghetti squash, transfer it from the freezer to the fridge until you're ready to reheat. But here’s the real busy-night bonus: Frozen spaghetti squash noodles can honestly go straight from the freezer to the microwave or steamer—and they warm up in just a few minutes. 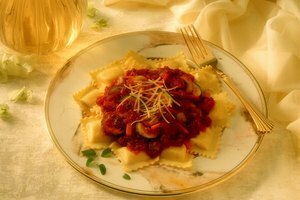 After that, it only takes a sprinkle of sea salt or fresh herbs for a healthy dish. And for crispier noodles, try reheating your spaghetti squash in a hot skillet on the stovetop. Hello, Monday night chow mein. 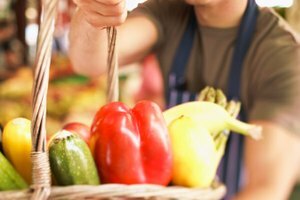 Happy Happy Vegan: Can you Freeze Cooked Spaghetti Squash? Diane Bobis is a Chicago-based lifestyle writer and mom. Since graduating from Saint Mary's College, Notre Dame, she has covered food, fashion, health, wellness, and beauty for dozens of outlets, including Womensforum.com, HowStuffWorks.com, BigOven.com, Hungry? Chicago Family, Winnetka Living, and Daily Dose of Knowledge: America. Wellness Habitat: Ashwagandha, Plant Therapy, Rachel Macy Stafford, Panda Planner, morning snuggles, and laughter.